How do I update WebDAQ firmware? Use the Job Editor to create a new job. Open Data Logger from the WebDAQ home page. The Schedule tab opens by default. 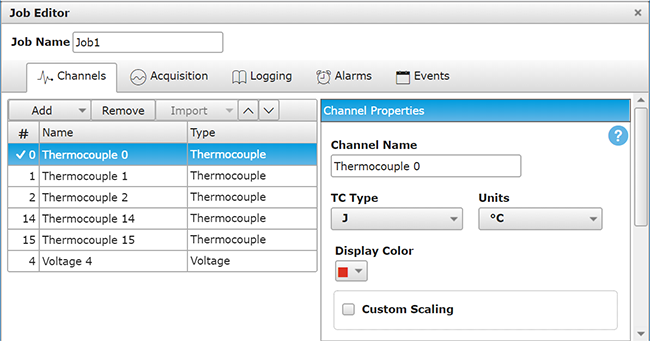 Add channels and define channel properties from the Channels tab. Specify the sample rate, auto zero mode, and trigger settings from the Acquisition tab. Enable logging and configure options from the Logging tab. Specify alarm conditions and actions from the Alarms tab. You can use the Next and Back buttons to move between tabs. Tap Finish to create the job and close the Job Editor. The new job displays in the job list on the Data Logger window. How do I modify job settings? Use the Job Editor to edit the settings of a specified job. Open Data Logger and select the job to modify from the job list. Tap to open the Job Editor, populated with the selected job settings. Modify job settings as desired, using the options on the tabs provided. Tap Finish when you are done to close the Job Editor and return to the Data Logger window. How do I scale channel data? Scale channel data to convert a measurement to a more useful value, such as voltage to PSI. Use the Channel options on the Job Editor to enable scaling. Scaling factors are applied as data is acquired. Open Data Logger. The Schedule tab opens by default. From the job list, select the job containing the channels whose data you want to scale, and tap . The Job Editor opens, populated with the selected job settings. From the Channels tab, enable the Custom Scaling checkbox, and enter multiplier and offset values. Tap finish to save the settings and close the Job Editor. Scaling factors are applied when data is acquired. How do I display a range of data? Use the Display Options panel to specify a range of samples to plot. Open Data Files, and select a .wdd data file from the Files tab. Tap launch. The Display tab opens with the data plotted from the file. Open the Display Options panel, and enter the range of samples to view in the Display Data Range Selection area. Tap Apply; the Display tab updates with the specified range of data. How do I import a channel list from one job into another? Use the Job Editor to import a channel list from one job into a another. This procedure imports a channel list into a new job. Tap to open the Job Editor and create a new job. Tap and select the job with the channel list to import. Configure other job settings, and tap Finish to when done. How do I save job settings to a file? Use the Data Logger to save job settings under a new name. Select a job from the job list and tap to open the Job Editor and create a new job. Tap and select the Save To File option under Job. Enter a name for the new job. Job settings are saved with the extension *.json. The new job appears in the job list. How do I import a schedule? Use the Data Logger to import schedule settings from a saved schedule file. Tap and select the Import From File option under Schedule. A dialog prompts for confirmation to replace the existing schedule with the imported file. Navigate to the location of the schedule file to import. Schedule files are saved with the extension *.json. The Data Logger Schedule tab updates with the jobs contained in the imported schedule. How do I configure the schedule to run every week? Use the Schedule Settings dialog box to configure schedule repeat settings. Tap to open the Schedule Settings dialog box. Under Schedule Repeat Settings, choose how often you want the schedule to run — consecutively, hourly, daily, weekly, or a custom value. Tap OK to save the repeat settings in the schedule. How do I run just one job in the schedule? You can run a specific job from the job list on the Data Logger Schedule tab. Select the job from the job list and tap (Run job icon). To run all jobs in the schedule, tap the Run All button. How do I stop a job from running? You can stop one job and trigger the next job in the schedule to run, or stop one job and all remaining jobs in the schedule from running. To stop the currently running job and run the next job in the schedule, select the job from the job list and tap (Stop job icon). To stop the currently running job and cancel all remaining scheduled jobs, tap the Abort button. How do I configure an alarm? Use the Job Editor Alarms tab to configure one or more alarms. You can associate each channel in the job with one alarm. From the job list on the Schedule tab, select the job where you want to configure an alarm, and tap to open the Job Editor. Tap Alarms and tap the New tab add a new alarm tab. Under Conditions, select alarm trigger settings. Under Actions, select the action when an alarm is detected. Tap Finish to save alarm settings in the job. How do I receive notification that an alarm occurred? Use the Job Editor Alarms tab to receive email or text notifications when an alarm condition is detected. Open the Job Editor Alarms page. Alarm notifications are configured in the Actions area. To receive alarm notification via email, enable Email and enter the email address to send the notification. To receive alarm notification via SMS messaging, enable SMS Message and enter the phone number to send the notification. How do I zoom in on strip chart data? Use the options on the Data Files Display tab to zoom in on strip chart data. Open a *.wdd data file from the file list and tap launch; the data file opens on the Display tab. Tap add and draw a border around the data to view, or zoom_in to zoom in on all of the data. How do I plot data stored in a data file? Use the options on the Data Files Display tab to plot data stored in a file. How do I change the color of channel data? Use the Job Editor Channels tab to set the color of channel data. Tap to open the Job Editor populated with the setting of the selected job. The Channels tab displays by default. Select a channel from the channel list, and choose a color from the color swatch in the Channel Properties panel. Use the System Clock panel on the Device Info tab to set the timezone. Note that this value sets the timezone on the WebDAQ hardware, which may be in a different location from the computer or device accessing the hardware. Open Device; the Device Info tab displays by default. In the System Clock panel, tap the "Change date and time settings"; a Date and Time dialog box opens. Select a timezone for the WebDAQ hardware from the drop-down list. Use the Device page Security tab to change the password. The password is "admin" by default. Open Device and tap the Security tab. Enter the current password when prompted. Enter a new password in the Enter Password field, and again in the Confirm Password field, and tap Submit save the change and write the new password to EEPROM. How do I configure network settings without DHCP? Use the Device page Network tab to manually configure network settings. Open Device and tap the Network tab. Set the IP Address Type to Static. The default IP Address, Subnet, and Gateway values are enabled. How do I restore the default network or alarm settings on the WebDAQ? Using a paper clip, press the CONFIG RESET recessed button on the WebDAQ rear panel. When pressed, the default network and security settings are written to the device and the WebDAQ is rebooted. How do I delete data, alarm, or configuration files that I no longer need? Use the Data Files window Files tab to delete files from internal device storage or external media. Open Data Files; the Files tab opens by default. Select the location of the file to delete fro the left pane, and the name of the file from the right pane. Data files have a *.wdd extension, alarm files have a *.txt extension, and both job and schedule configuration files have a *.json extension. Tap delete_forever to remove the file from the storage location. Why did I get an 'Insufficient disk space' error? An "Insufficient disk space" error is returned when the selected storage location is full. Why did I get a 'File too large' error? The maximum file capacity of external media formatted with the FAT32 file system is 4 GB. If the log file on FAT32 media exceeds 4 GB, a "File too large" error is returned and the acquisition stops. If you expect to acquire a large amount of data to a single file when logging to external media, reformat the media using a different file system such as NTFS before starting the logging session. USB drives and SD cards are available formatted with different file systems. WebDAQ supports FAT32, exFAT, ext2/3/4, NTFS file systems. Refer to the table below for key differences between these file systems. Use the file system that best suits your needs. FAT32 is not appropriate for high-speed, long term logging, since the file size is limited to 4 GB. FAT32 is the default format of SDHC memory cards. When generating large data files, use external media formatted with the exFAT file system. exFAT is the default format of SDXC memory cards. exFAT is not ideal when monitoring live data, as performance can be slow. Linux requires additional software to access exFAT drives. When running Linux, use external media formatted with NTFS. Mac can read NTFS drives, but can't write to them. If you only have a Windows machine, use external media formatted with exFAT or FAT32. When using external media only to transfer files using the WebDAQ file download feature, we recommend ext4.